In November 2005 I took possession of my Bar Crusher 610C (now 615C) and it has given me and my wife endless hours of pleasure ever since. I reckon my Bar Crusher has probably been launched from more boat ramps and fished in more locations in these two years than most. I live in Western Victoria and in 2006 we headed off with a tent and the boat on a three-month holiday travelling up the east coast as far as Cooktown, fishing at almost every possible location along the way. 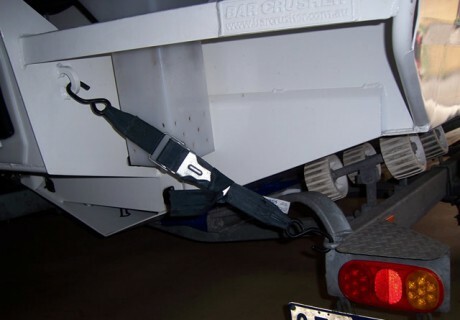 The tie-down lugs (see photos) which I had the boys from Bar Crusher incorporate on my boat work fantastic and the boat sits beautifully on the trailer and tows like a dream. Original tie downs still in great shape after travelling about 20,000km. The boat caused quite a lot of interest along the way as not many people in the top end had seen a Bar Crusher (but many had heard about them). While travelling through Innisfail, we were ‘chased down’ and followed into the caravan park so that a local could check out the boat. He had seen pictures and read about the Barcrusher but he hadn’t actually seen one and as he was planning on ordering one himself he was very keen to check it out. This year we travelled to Ceduna in South Australia and had similar experiences. Whether fishing in the bay for whiting or going out chasing the bluefin tuna in Portland the boat has always performed beautifully and I would recommend it to anyone.